Last night, Freya’s sister was bitten by a horrific beast in the snowy hills of Ysland. Now, Freya has only a few hours to find a cure for this strange plague before her sister becomes a ravening fox demon. With her husband Erik and the young witch Wren at her side, Freya explores deserted cities full of ghosts and lone survivors on the edge of madness. She finally seeks answers in the ancient city of Rekavik where she must face the deadly witch queen Skadi and the vicious warrior Leif Blackmane. This book rather surprised me as I was expecting something along with a steam-punk flavor as I found in the first book in the series. Instead this particular book was pure fantasy with a very Nordic flavor. Once I got over that particular shock, I very much enjoyed FREYA THE HUNTRESS. In fact in my opinion FREYA THE HUNTRESS is the superior book. This book has a classic fantasy plotline that draws heavily from Nordic mythology, interesting characters and a wonderful blend of horror and humor. 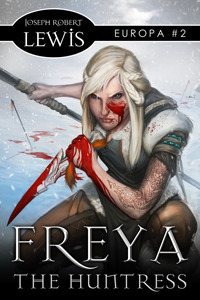 Freya is a strong heroine whose motivations are plain. Erik, her husband, is her silent supporter. But my favorite character has to be Wren. Some of her one sided conversations with Wodan are hilarious. ***I received this book at no charge from the author in exchange for an honest review.